TechPowerUp noticed several snow white products from ThermalTake at CES, including cases, coolers and high-end PSUs. Pictured below is the "Snow Edition" of the Toughpower XT 1275W, a modular power supply with a white enclosure and white cables. 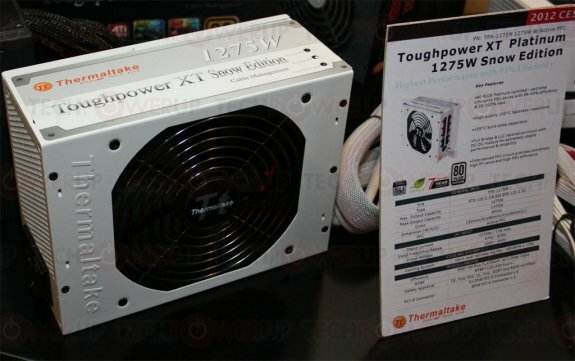 The Toughpower XT 1275W modular PSU is pictured below. Aesthetically, its main body is colored white, but its fan grille is the same chrome one, and its fan impeller is black (although the press-shot in the placard features a white impeller). Its fixed cabling has white sleeves, and modular (detachable) ones are pure-white flat cables, with black or red colored connectors to add a nice contrast. The PSU has stellar efficiency, as it is 80 Plus Platinum certified. It features peak power output of 1375W, although 1275W is guaranteed and advertised. It features full bridge and LLC resonance circuitry with the DC-DC switching module, and interleaved active PFC. Its cables include eight PCIe power connectors, including six 6+2 pin, and two 8-pin. It is backed by a 7-year warranty.